OK...so my blog today has everything to do with what I want. 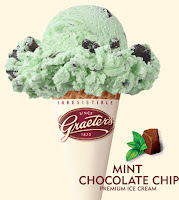 I REALLY WANT SOME MINT CHOCOLATE CHIP ICE CREAM! I'm on this eating better kick and I've been counting my calories and working out and things have been going great! I'm feeling really good and I really can't be more proud of myself for sticking with it but let's get down to the topic at hand. A girl can only go so long without ice cream. Maybe other girls aren't like me but I know for a fact it's in my blood. You see my dad is a totally ice cream fanatic so I believe it's genetic. Mint Chocolate Chip Ice Cream that is! I can do other ice cream but there's something about this particular flavor. Oh yeah...it has to be green too! None of this white stuff...it just isn't the same. Nate got the white stuff for me one time and I had him take it back. He doesn't know ice cream like how I do. It's evidently not in his blood. He's got pizza in his blood but that's a whole other post. This is about me and what I want. So, the reason I'm blogging about this particular desire? It's because I can't have it. At least not til tomorrow. I weigh in at church tomorrow and I don't want to tip the scale the wrong way, if you know what I mean! So, instead of grabbing a bowl I'm going to sit and type away my desire to head to Greater's. I really can't believe I'm doing this but you know how you feel when you journal about something and it makes you feel tons better? Well, let's just call this therapy! I'm very much looking forward to Tuesday afternoon after I weigh in! Greater's here I come! Last night Nate and I went to the concert and had a great time! It was so fun to not have kids and to have no agenda or schedule. We dropped the girls off at my mom and dad's and headed to Steak & Shake. I know, I know...not the typical place to go out on a date but it was close to Grace and we wanted to be sure to be early so Steak and Shake had to do! I had completely screwed up my eating schedule so I thought I would make a day of an eating schedule gone bad! Notice I didn't say diet - I hate that word! Back to the story! We got to Grace as the doors were opening and found our seats which were in the third row...amazing! We chilled out for an hour and it was finally "game time"! POG performed first and they did their same ole' same ole' songs. Pretty boring but it was fun relivin the old days. The best part of the concert was supposed to be the opening band. 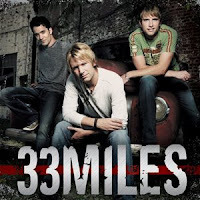 33 Miles...they were awesome! I've heard their songs on the radio but I've never heard of the group. They rocked! Nate picked up two of their CD's so we can jam in the car! Overall it was a great concert. $46 well spent! If you're looking for a good CD pick up their new one! Tonight Nate and I are going to see Point of Grace at Grace Brethren. We're pretty excited and bummed at the same time. Two of the original girls are no longer with the group and one girl has been with them for maybe two years. It's going to be so weird to see just three girls tonight but I'm hoping that were going to get wowwed! I've never been disappointed with a POG concert so I've got high expectations. We've got good seats so we'll see!! Last year Nate and I saw them in Nashville and it was amazing! We were in the front row of a church and they were right in front of us...so close they could spit on us. Good thing they didn't but it was very exciting! I'll let you know how it goes...until then "I'll be Believing"!!! Glad you're all in my "Circle of Friends"! I just got home from another night of ZUMBA! I opted to not go to MOPS and instead went to ZUMBA! I hadn't had a good workout this week and felt I really needed one. I started ZUMBA last week and I have to admit I felt VERY weird about the whole thing but when I started thinking more about it, I feel like I burn a ton of calories plus I feel like I'm getting a real workout. Last week after Zumba, a co-worker and I were laughing about the whole experience and I'm proud to announce that we both came back for week two! Tonight there were fewer people there than last week but I think I had more fun than last week. Probably do to the fact that there wasn't all the pressure of it being new! If you're interested, it's in Sunbury on Tuesday & Thursday nights from 6:30-7:30 above the old hardware in the square. If you have questions let me know! Hope to see you there! 7) Gets so tan in the summer he looks like an Indian! 8) Is a really good story teller - he must get it from his dad and grandpa! 10) Has a million dollar smile!